If a search for “voice record” on the iTunes Store is any indication, there’s a market for voice-recording apps for the iPhone (and the second-generation iPod touch). After all, it’s handy to be able to quickly take a verbal note, to capture a memorable moment, or to record a business meeting or interview. One such app is iTalk Recorder from Griffin Technology—yes, that Griffin Technology, the one well known for its iPod and iPhone accessory hardware. And the company’s first foray into iPhone software is an impressive one. iTalk can use the iPhone’s built-in microphone. To use iTalk with the 2G iPod touch, you need a headset with a microphone; for example, an iPhone headset, Apple’s recently-released In- Ear Headphones with Remote and Mic, or one of Griffin’s own compatible headsets or adapters. Talk to Me: iTalk Recorder offers a simple recording screen, with the button changing from red to green when you record audio. iTalk Recorder’s recording screen is simple and straightforward. First you choose a recording quality—Good, Better, or Best—and then you tap the large, red Press To Record button. (You can give the recording a name beforehand or afterwards.) The button changes to a large green Recording button that displays the current recording time; below that is a visual level meter, along with text displaying the date and time the recording was started, the recording quality, and a live-updated indicator of the recording’s file size. Griffin has included a couple thoughtful recording features. The first is that the screen can auto-rotate 180 degrees; this lets you view the screen properly even if you turn the iPhone or iPod touch upside down so the microphone is on top. Second, you can can turn off the screen (by pressing the Sleep/Wake button) to prolong battery life during recording; iTalk Recorder will continue to record. Recording length is limited only by the available space on your iPhone or iPod touch. According to Griffin, an hour-long recording will use approximately 75MB of space at Good quality (11.025kHz sample rate), 150MB at Better quality (22.05kHz), and 300MB at Best quality (44.1kHz). Recordings are in AIFF format. As with other iPhone recording apps I’ve seen, iTalk records in mono; still, I could easily hear the difference between the three quality levels—while all were suitable for basic voice memos, the Best quality offers surprisingly good fidelity. A Record of Recordings: The list view for iTalk Recorder shows the date, time, size, and length of each file. iTalk Recorder’s list view displays all your stored recordings in alphabetical order. Each entry includes the recording’s date and time, size, and length. A tiny play button (too tiny, in my opinion) lets you listen to the recording using headphones or the player’s speaker. Tapping a recording’s arrow button reveals more information about the file; lets you rename the file; and lets you add notes about the recording. Unlike most list views on the iPhone, you can’t delete a recording by swiping across it; you must switch to Edit mode. Deleted recordings are moved to a Deleted Recordings “folder”; you can view this screen to undelete recordings or to permanently remove them from your phone. 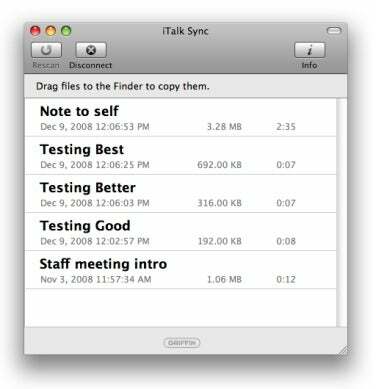 In Sync: iTalk Sync, a free utility, moves recordings from your iPhone or iPod touch to your Mac. There are a couple minor glitches with iTalk that Griffin says will be fixed in the next version—for example, your iPhone’s Region Format must be set to United States in order to save recordings. But overall I’ve found it to be an excellent voice recorder that stands out among the many me-too recording apps. The standard version of iTalk is free, but shows small ads at the bottom of the screen during use. I found these ads to be relatively unobtrusive, but if you object, an ad-free version, iTalk Recorder Premium, is available for $5.